How often do you see reviews of premium motherboards packed to the gills with features? There's good reason for this from a manufacturer's point of view because, say, selling a Z370-based motherboard for £200 is more profitable than hitting a £100 price point for an entry-level offering. The astute motherboard maker knows that it shifts real volume lower down the stack, typically with boards that are sold into system integrators who build many of the PCs you see reviewed on HEXUS. This is why it makes sense to look at a mainstream Z370 board on which to sit an 8th Gen Core processor, because not only is it a good fit for SIs, it makes sense when budgets are tight. MSI is of this thinking, too, and it has pitched us a Z370 board costing £115 yet accommodating pretty much all the features you would want when pricing up a mid-range build. Enter the Z370 PC Pro. There's more to this board than meets the eye. A total of 20 white LEDs line the rear of the PCB and are concentrated on the top and bottom. And if you want more, RGB that is, the left side has the usual 5050 RGB strip header for extra, optional, multi-colour illumination. Six fan-headers include	one for a dedicated water pump, and most are dotted sensibly around the board. That said, we'd move the CPU header down just a notch so that the tall, screwed-in right-hand heatsink doesn't get in the way when hooking it with a cooler already in place. It's normal not to see any enthusiast-level features such as onboard buttons or a debug screen, but MSI does provide basic troubleshooting via four LEDs lined up by the 24-pin power port. The LEDs signify the debug status for the CPU, memory, GPU, and for boot, so should they stay on one of the first three, you know where the likely failing point is. 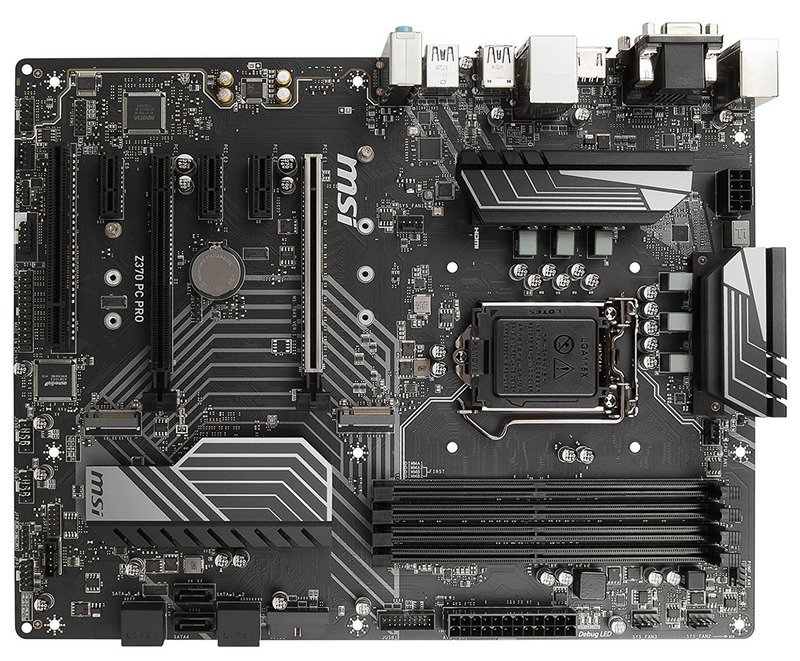 We quite like the way in which MSI has rotated two of the chipset's six Sata ports, enabling easy drive connection, and the rotated ports are just high enough up the PCB as not to foul an extra-long graphics card. Sensibly, MSI keeps two full-speed M.2 slots, with the upper supporting 110mm drives and the lower the standard 80mm. Neither have drive shielding/cooling, sadly, and it can't cost more than a dollar to have one in place? Only the upper graphics slot is strengthened - making sense as most systems using this board will be equipped with a single GPU - though dual-card CrossFire is supported, as well. Nvidia's SLI requires extra cost to be met by the motherboard guys, something which MSI, sensibly, is unwilling to do here; plenty of dearer Z370 boards from the company do have explicit SLI support. The nature of the PCIe lane arbitration on Z370 means that there is always an element of storage/expansion compromise when populating all slots/ports. MSI's compromise makes sense - running a couple of PCIe-based M.2 drives - storage and Optane, for example - disables the x4 slot on the bottom. The usual Realtek ALC1220 codec is replaced by the cheaper ALC887. The quality of the audio remains sufficient for most enthusiasts/gamers, with MSI offering tweaking options through Audio Boost. We're glad to see that USB 3.1 Gen 2 is present and correct, emanating from the popular ASMedia 3142 two-port controller and offered in both Type-C and Type-A ports. Intel supplies the Gigabit LAN. Outputs, too, are decent, as the Intel CPUs' baked-in graphics can be pushed out via HDMI, DVI and, for legacy reasons, VGA. 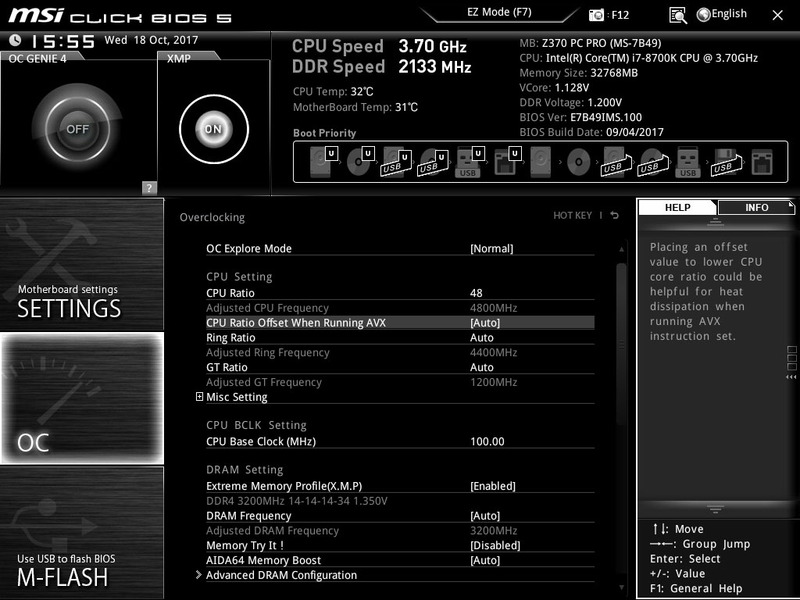 The firmware, meanwhile, uses version five of Click BIOS, so good fan control and relatively easy navigation. Subjectively, it still feels a tad slow compared to some of the competition, however.